“The way of the pioneer is always rough.” The Russian Mennonites who arrived in Manitoba in the late 1800s would most likely agree with that statement. They embarked on a long, hard journey all the way to Canada with the hopes of finding good farmland and religious freedom. Once here, these hardy pioneers left a historical mark on our province through the structures they built. 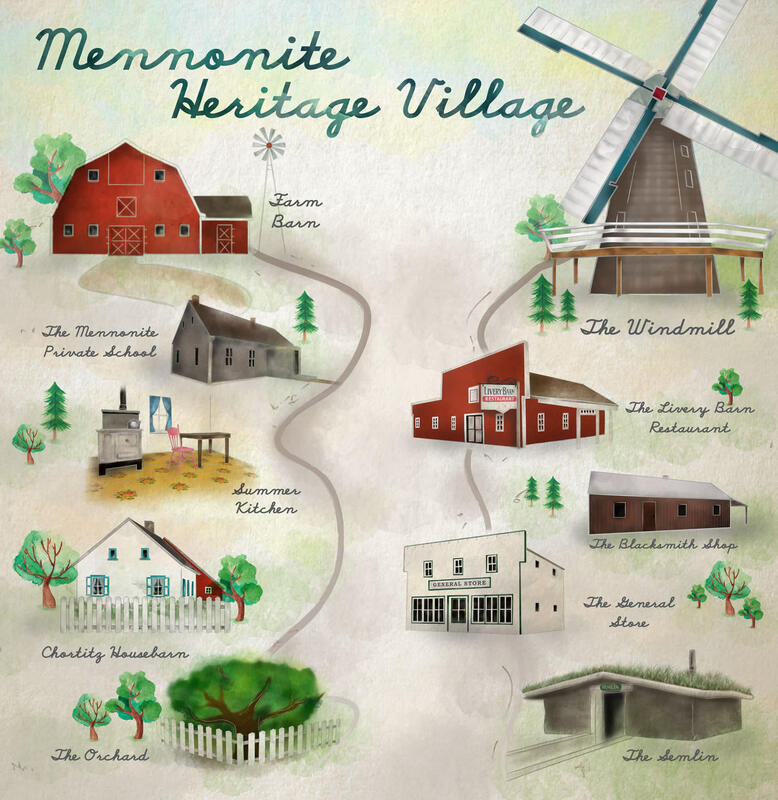 And the Mennonite Heritage Village is where you’ll find the best representation of these structures — some unique to a Mennonite farm, some more familiar to rural communities of that era. The windmill represents the ingenuity and skill of the Mennonite pioneers who built these amazing structures in many villages in Southern Manitoba. 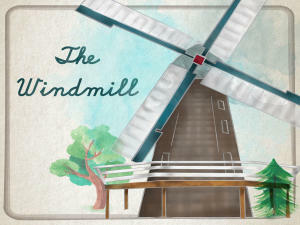 Canada’s only operational windmill produces flour used in the Livery Barn Restaurant. You can purchase a 4 lb bag to take home with you. Horses, goats, chickens, geese, sheep, rabbits and donkeys, oh my! 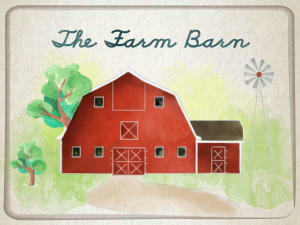 To represent the mixed farms of the pioneers, this barn is where you can watch working farm animals during the summer months. During the hot months, the summer kitchen is where family meals were prepared so that the large house could stay cooler. 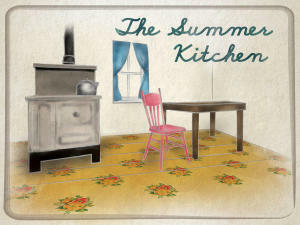 The typical Mennonite home did not allow for much artistic expression, however the summer kitchen was where many Mennonite women would demonstrate decorative skill by painting the floors in colourful patterns. 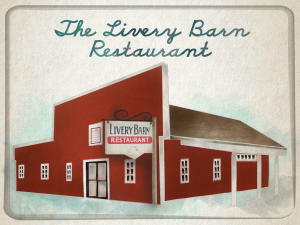 Reminiscent of livery barns that were “rest stops” for pioneers, this place offers you refreshing beverages and a taste of traditional Mennonite food. The foarma worscht (locally made pork sausage) and vereniki (perogy filled with cottage cheese) smothered in schmauntfatt (savoury cream gravy) are especially delicious. 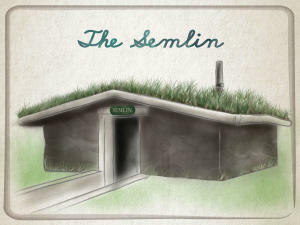 Built by cutting a hole in the ground three feet deep, then piling sod in layers 4 feet high, semlins (or sod houses) were the first homes constructed by Mennonite immigrants in 1874. Although crude, they provided the shelter necessary for survival on the Manitoba prairies. The housebarn was a unique building style the Mennonites brought to Manitoba. This dwelling type is traced back to Prussia/Poland where Mennonites settled during the late 1500s. The museum’s housebarn was constructed in 1892 by Jacob Teichroeb in Chortitz Village, south of Winkler. 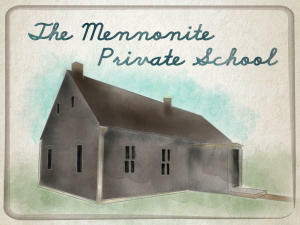 When Mennonites first arrived in Manitoba, they brought their private schools with them. These schools focused on the importance of education, that it should be equal for both boys and girls, and that it should strengthen Mennonite traditions, values and heritage. 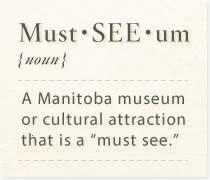 In the early 1900s, the Manitoba government eliminated these private schools, which saw Mennonites either accepting the change or emigrating to Mexico or Paraguay. 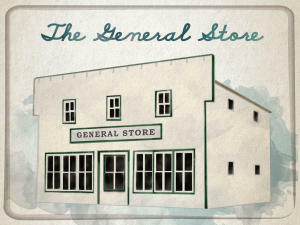 The General Store was the lifeblood of a pioneer community. It’s where you could purchase and order your basic supplies, catch up with your fellow neighbours and learn the latest news. This is the perfect spot to sample some old fashioned candy and browse through a wide variety of locally-made crafts. When Mennonites arrived in Canada, they strived to recreate the finely cultivated orchards and flower gardens that they left behind in Russia. These gardens were a source of food, beauty and sustainable living. 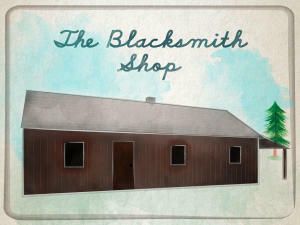 The Blacksmith Shop was an important part of any industry in the late 1800s. A blacksmith was a laborious job where ploughs were sharpened, horseshoes were made and old machinery was repaired. The museum’s shop displays the forge and tools needed for a wide variety of jobs performed by the blacksmith. Relive your past through a variety of pioneer activities and demonstrations, steam powered threshing, music and entertainment, kid’s activities daily, and lots of good food and fun! A highlight of summer for many. This event is held every August long weekend. Experience harvest work, steam powered threshing, a variety of pioneer demonstrations, hog butchering, music and entertainment, and lots of hearty food. Held on the Monday of September long weekend. Enjoy a celebration of fresh fare in a friendly rural community. 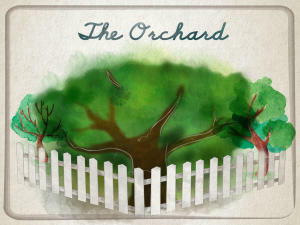 You will be treated to a buffet feast of locally grown produce and other local foods at this annual fundraising event. Held the third Sunday in September in conjunction with Open Farm Day. 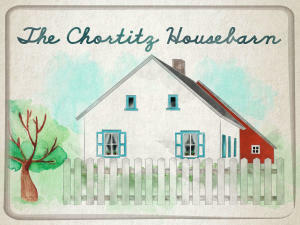 Graphics created by Myra Ramos, Production & Design Coordinator.